Lucky for us local food lovers, Vermont Salumi is just one of several local charcuterie makers utilizing the curing facility at the Mad River Food Hub, their chorizo was perfect for these mussels… lots of flavor with a little bit of zip. Start by mincing a two inch length of the chorizo and sauté for two minutes in a large pot with a generous pour of olive oil. Stir in a finely chopped shallot, and three minutes later, four to six minced garlic cloves. When the shallot is translucent add a cup or two of clam stock depending on how many pounds of mussels you’re cooking. After bringing to a simmer add salt and pepper to taste. 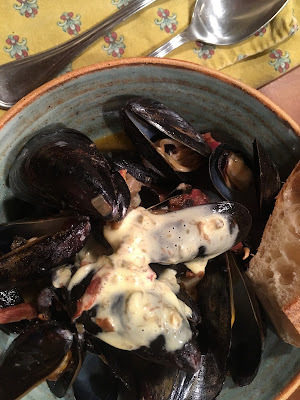 When you’re ready to go, turn up the heat to medium, add the mussels to the pot, cover, and cook until they’re firm all the way though, less than five minutes. Spoon into bowls with plenty of broth and garnish with chopped cilantro or as pictured here, caper aioli.